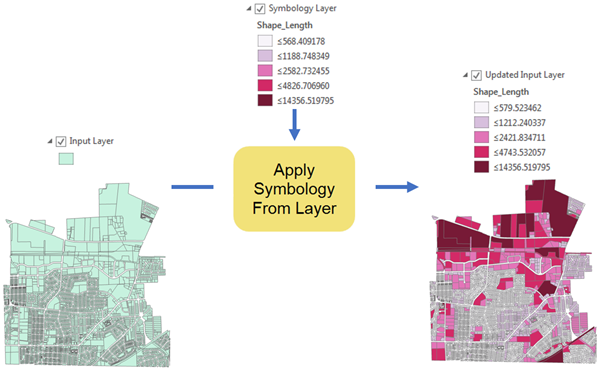 The symbology layer must match the data type of the input layer; for example, a feature layer cannot be applied to a raster layer and vice versa. The symbology can only be applied to features of the same geometry; for example, point symbology cannot be applied to a polygon layer. 3D properties such as extrusion and offset are not supported with this tool. You can choose to maintain or update the symbology via the Update Symbology Ranges by Data parameter, or leave the default. By default, symbology methods can be dynamic; for example, the symbology is updated to reflect the characteristics of the input layer as shown below. The five-class Natural Breaks classification method from the symbology layer is applied to the input layer, and the range values are updated to reflect the Shape_Area values of the input layer. The unique values are updated to reflect the input layer's values. If you do not want the unique values classification to be updated, choose the <all other values> default symbol in the symbology layer. The range values are updated to the values of the input layer. If you do not want your range output to be updated, choose manual classification. The range values are updated to reflect the values of the input layer. The layer to which the symbology will be applied. The symbology of this layer is applied to the input layer. Both .lyrx and .lyr files are supported. Field type—Determines if the field is the symbology value, normalization, or other type. Source field—The symbology field used by the symbology layer. Use a blank value or "#" if you do not know the source field and want to use the default. Target field—The field from the input layer to use when applying the symbology. VALUE_FIELD— Primary field used to symbolize values. NORMALIZATION_FIELD—Field used to normalize quantitative values. EXCLUSION_CLAUSE_FIELD—Field used for the symbology exclusion clause. CHART_RENDERER_PIE_SIZE_FIELD— Field used to set the size of pie chart symbols. ROTATION_XEXPRESSION_FIELD— Field used to set the rotation of symbols on the x-axis. ROTATION_YEXPRESSION_FIELD— Field used to set the rotation of symbols on the y-axis. ROTATION_ZEXPRESSION_FIELD— Field used to set the rotation of symbols on the z-axis. TRANSPARENCY_EXPRESSION_FIELD— Field used to set the transparency of symbols. TRANSPARENCY_NORMALIZATION_FIELD—Field used to normalize transparency values. SIZE_EXPRESSION_FIELD— Field used to set the size or width of symbols. COLOR_EXPRESSION_FIELD—Field used to set the color of symbols. PRIMITIVE_OVERRIDE_EXPRESSION_FIELD— Field used to set various properties on individual symbol layers. Specifies how symbology ranges are updated. When the input layer is empty. When the symbology layer uses class breaks (for example, graduated colors or graduated symbols), and the classification method is manual or defined interval. When the symbology layer uses unique values, and the Show all other values option is checked. UPDATE —Update the symbology ranges. MAINTAIN —Maintain the symbology ranges. The following Python window script demonstrates how to use the ApplySymbologyFromLayer function in immediate mode. The following stand-alone script shows how to use the ApplySymbologyFromLayer function in scripting. # The symbology layer is symbolized by population normalized by area.